Jennifer Lopez rang in the New Year performing on NBC’s New Year’s Eve Season 2018 on Monday (December 31). We may not have loved her last dramatic outing, but on this occasion her lace embellished Galia Lahav jumpsuit suited her to a tee. 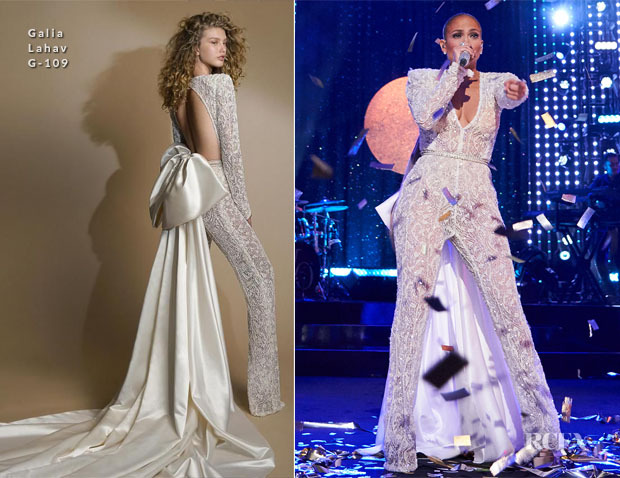 This jumpsuit originally hails from the designers G-109 Bridal collection, so that may explain the bow accented ivory train, which worked perfectly as a dramatic element to her performance piece.